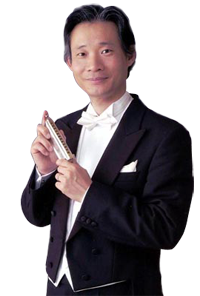 Born in Kyoto/JAPAN, Yasuo WATANI is one of the world's leading chromatic harmonica soloists. He had his first lessons with Tadao KOBAYASHI in 1966 and has won prizes in competitions at a young age. After graduating from the University of Doshisya in Kyoto in 1984 with a degree in Economics, WATANI studied the chromatic harmonica with Helmut HEROLD at the Hohner Konservatorium Trossingen in Germany from 1984 to 1988. He was invited to stay on as a lecturer at the Hohner Konservatorium Trossingen and taught from 1988 to 2002. Since 2005 he is a lecturer at Senzoku-Gakuen College of Music. WATANI win 1st Prize for both the International Harmonica Competition in the Netherlands (1988) and the 2nd World Harmonica Competition in the Championships and Festival in Trossingen. Germany (1989). With an active performing career, WATANI has staged numerous solo concerts in many parts of the world including Germany, Japan, HongKong, Argentina and Brazil. In addition, he has performed as a soloist with W_rttemburg Philharmonic Orchestra, Kyoto Symphony Orchestra, Japan Shinsei Symphony Orchestra, Gunma Symphony Orchestra, Sendai Philharmonic Orchestra and the New Japan Philharmonic Orchestra conducted by Seiji OZAWA. His stunning Performances have been recorded both on radio and television in Germany and NHK Japan.